Happy Birthday to You...Happy Birthday to You..Happy Birthday Lily & McKenzie...Happy Birthday to you!! This time last year at 2:31am & 2:33am our very precious miracle babies were born. They were very small, very sweet and we were VERY scared. When they were just 16 weeks in the womb, we were told they had a 50/50 chance at life and we had "options"... We prayed and we chose life and so did the Momos! This past year has been such a victory...I wake up daily and THANK GOD for allowing us to have His children and watch them grow. This time last year, I fell in love again, two became four and I became the Momo's Momma! Today is your 1st Birthday...you can't imagine how exciting this is for all of us, not just your mom and dad, but your entire family and extended family. We have been watching two little girls who were born at 1lb14oz and 2lbs1oz grow to become the sweetest little girls we could ever ask for. 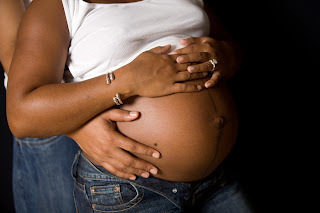 Your birth beat the "odds", but we never bet against you! We were bringing home two little babies no matter what! You have a lot of people to thank for keeping you strong during your NICU stay, your doctors, nurses, family, friends and most of all God. We know that you will be raised to understand that you are His children and it was in His plan to give you to us! This time last year was bitter sweet, you were here but you were so small and everything was so scary...today you are 16lbs7oz (Lily) & 16lbs6.5oz (McKenzie)...you are both crawling and you LOVE "If your happy and you know it clap your hands" you both clap to the song with such joy! 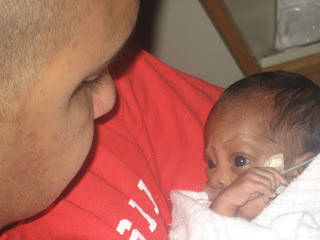 You are both so strong...we will remind you of your strength when you feel like you "can't" do something. Never forget how amazing you are! We hope when you are old enough to read this, you are healthy and vibrant young ladies on a mission for greatness! One day you will understand what all the "fuss" is about for EVERY birthday we share with you. Your "Birth" day is more than just a day, it is a celebration of Life, Love and Victory. This picture was taken one month before you were born. You will always be safe in our hands. After 9.5 weeks the Momos were finally ready to come home. 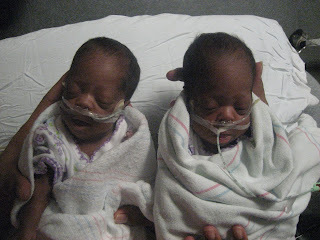 Born at 28 weeks 1lb14oz and 2lbs1oz, they are leaving the NICU at 37.5 weeks at 5lbs3oz and 5lbs6oz each! It was hard leaving McKenzie behind, while walking out those doors with just Lily on that Wednesday afternoon, but after coming home with a baby on oxygen and apnea monitor, I was thankful they gave us "one at a time"! I can't even explain to you the nervousness I felt driving home with Lillian in the car, I was just praying to make it successfully to the front door of our house which was 5o mins away from the hospital. I couldn't imagine driving home with two of them! ...and Finally I cried...tears of Joy... I had been holding onto these tears since the day they were born...and I'm glad they were finally able to be released...and not because I was sad...but because I was about to begin the happiest days of my life! Before I go...I just want to give a HUGE THANK YOU to the GREAT STAFF at SINAI HOSPITAL... 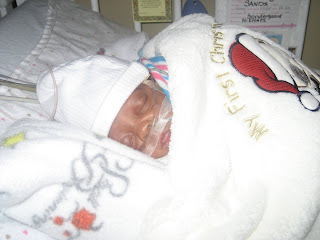 I don't know if any of them will ever come across this blog...but I couldn't end my NICU experience without thanking them. It is not everyday you find people who love their work as much as these guys did. They made you feel like your babies were the only ones that were there and were always a priority. It is encouraging to know that these are the people who help moms and dads like us on a daily basis...and for that I thank you ALL. 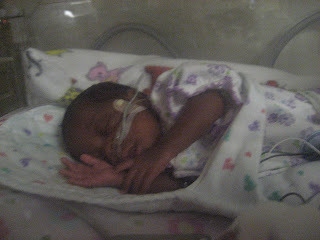 McKenzie weighed in today at 4lbs13oz...on about 21%-25% oxygen....in a crib...and looking sweet in her yellow onesie! 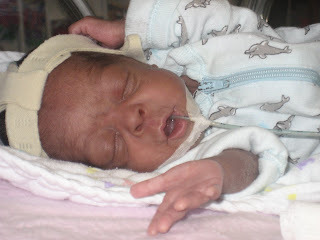 She is drinking 40ML of breast milk every 3 hours and takes about 5 out of her -8 feedings a day by mouth! You go girl... She also has a heck of a fart!!! This baby girl can clear the room! Lillian weighed in today at 4lbs10oz... she is on HOME oxygen... in a crib and in need of a bath as I'm typing this..we haven't put her in her yellow onesie yet! 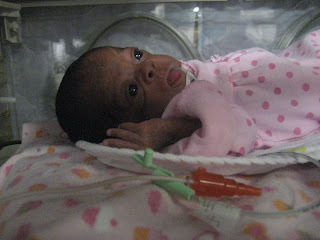 She is also drinking 40ml of breast milk every 3 hours and is nippling her bottles too! And.. drum roll.... She PASSED her CAR SEAT TEST TODAY!!! hmmm do I hear Discharge papers being typed up soon!!! The past few weeks I have felt like I am in one of those cartoons where everything happens so mechanically. Get up, Pump, shower, dress, eat, drive, hospital, pump, work, pump, pump, pump, hospital, drive, eat, pump, sleep. This is my "groundhogs day" EVERYDAY. If it isn't for the girls... I'm probably not interested in doing it. It is funny how you watch your priorities change so quickly and how the "S" on your chest appears out of nowhere to prove you can do it all and can't be stopped!